Caribbean (by Roundtree & Yorke). 80% Linen, 20% Rayon. 21”( shoulder seam to shoulder seam). Button-Front Shirt. 27.5” (end of sleeve to shoulder seam). Size Large Tall in Great condition. Neck seam to bottom: 33.5in. Vtg L.L. Bean cotton chambray shirt with patch pocket, in great shape, gently used. Length (bottom of collar to tail): 35.5". Gently used, good condition, rayon/polyester, size Large and Tall. Shoulder to Shoulder 22". Sleeve - Shoulder to End 25". Size Large Tall. Made in Canada. Underarm to Underarm 25". No missing buttons. 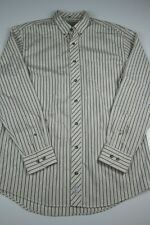 Item: Beautifully Detailed Button Front Flip Cuff Striped Casual Dress Shirt. Color: White, Blue and Gray. Label: LL Bean. Gently owned. Feels more like a thicker casual shirt than a dress shirt. Material: Cotton. Length (from back of neck to bottom of shirt): 36". Sleeve Length: 26". I am human and may miss a few things. Classic fit. Long sleeves. Chest logo. 100% Cotton. Spare button bag is still attached. 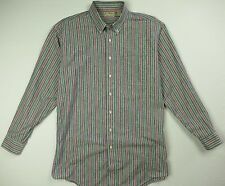 Features: Nice shirt with a button front, button down collar, long sleeves with button cuffs, chest pocket. Length, base of back collar to bottom hem: 32.75" (83.1cm). Sleeves, mid collar to hem: 36" (91.4cm). Size: LT Large Tall. Color: Rust. Fabric: 100% Cotton. Long Sleeve, Button Front, 1 Chest Pocket. Arm Length: 26.5". Pit to Pit: 25". Top to Bottom: 36.5" (Bottom of Collar to Back Hemline.). Blue & White Pinstripe. 66% Cotton 30% Polyester 4% Spandex - Stretch Non-Iron. Long Sleeved. Machine Washable. Button Down Collar. 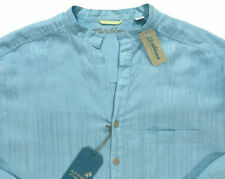 Men's CARIBBEAN Corydals Sea Blue Linen + Open Neck Shirt LT TALL NWT NEW HOT! Caribbean (by Roundtree & Yorke). 80% Linen, 20% Rayon. 20”( shoulder seam to shoulder seam). Button-Front Shirt. 27.5” (end of sleeve to shoulder seam). Color: Navy Blue. Size: LT Big & Tall. Sleeve Length: Long. Material: 100% Cotton. Sleeve length (shoulder seam to cuff bottom): 26-1/2". Length down back (base of collar to bottom hem): 34". Soft cotton shirt flannel. Wrangler Western Shirts. Pearl Snap front. Large Tall LT. Black, brown, bronze copper. Long sleeve L/S. Color/Size: "Silver Surf" [Tone on Tone Stripes], LT. Easy Care, Machine Washable. Woven Long Sleeve, Microfiber T-Shirt. Dress or Casual - Work to Play. Ve ry n ic e so ft c ot to n sh ir t in a b lu e/ wh it e st ri pe. Th e sh ir t is i n ex ce ll en t cl ea n co nd it io n. M ar ke d si ze Large Ta ll. 33 ” lo ng. 23 ” ar mp it t o ar mp it. Shirt is in great shape. Length 33". Sleeves 27". All clothing is in great condition, unless otherwise noted.